Monkeydog Productions have three one-man shows available for touring: the strange-but-true Cold War tale The Trials of Harvey Matusow, the traffic warden tragicomedy High Vis, and the award-winning Something Rotten, a paraquel to Hamlet, in which the actions of the Danish prince are assessed by his much-maligned uncle, King Claudius. All three have recently been seen, under the umbrella title Men Without Friends, at the Hove Grown and Stroud theatre festivals. Harvey Matusow was America's most notorious liar – for a while, at least. A New York communist who switched sides, he ended up testifying for every major red-hunting organisation in early-’50s America – HUAC, SISS, McCarthy's committee, the works – then, after four years, he changed sides again and admitted he'd made up almost all of his testimony. Researched in the Matusow archives at the University of Sussex, The Trials of Harvey Matusow was directed by Ralf Higgins and premiered at the 2010 Brighton Festival. It went on to win the FringeReview Outstanding Theatre Award. A trafficomedy about a warden under siege. Quint McBride is a proud man, and he's proud of his job. Some people, though, have no respect – he's thinking in particular of the hooligan who keeps coming after him with an air rifle – as a result of which he's been taken off front-line traffic duty to teach a bunch of new recruits. Humiliating, that's what it is. Humiliating. No offence. 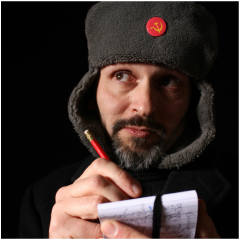 High Vis made its debut at the 2013 Brighton Festival, where it was acclaimed by remotegoat.com as “a master class in writing and performance”, and went on to a run of 24 performances at the 2014 Edinburgh Fringe (“terrific stuff,” said Quentin Letts). Hamlet’s Uncle Claudius has his say at last! Consider this: your dearly beloved brother has died, and with him the hopes and dreams of your nation. It falls to you to pick up the crown and the pieces; a hard enough task as it is without the constant sniping of your nephew. Of course he resents your having wed his widowed mother – that’s only natural – but shall nature justify his increasingly outrageous behaviour? Fratricide! Regicide! These are the things of which you stand accused! Aye, something is rotten in the state of Denmark, and something must be done about it – blood or no blood. 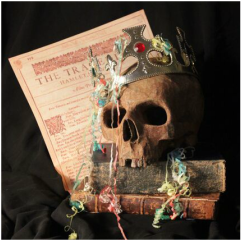 A paraquel to Shakespeare’s greatest work, Something Rotten won an Argus Angel award at the 2016 Brighton Fringe.